I've been going on some longer rides recently and found that my normal saddle bag was just a little too small. I normally carry one of the middle sized Topeak saddlebags that are well designed and very good, but they only carry the bare basics.....being a couple of spare tubes, a small multi tool, tyre levers, a rear light, and some cash. I wanted a saddle bag that would carry a little bit more without being too ugly or too big. Apart from the basics I wanted a saddlebag that would also fit a foldable spare 700C tyre, a small first aid kit, and some snacks. After looking in bike shops and on the internet I spyed the Carradice range of saddlebags. They are made from a waterproofed heavy cotton duck fabric that is very durable. 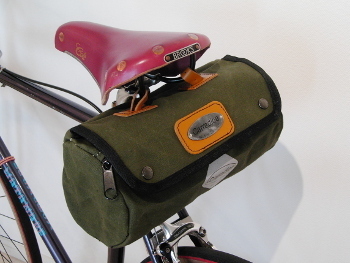 In particular I saw the "Carradice Zipped Roll" saddlebag pictured below. This saddlebag was the perfect size for my needs! The black version with white leather straps. The green version with honey leather straps. They fit to saddles or handlebars with 3 sumptuous leather straps - two for the saddle loops or handlebar and one to go around the seatpost or stem. The main enclosure is zipped - very secure - with a pre-stud flap over the top to keep out the rain. They are made from bulletproof heavy cotton duck fabric which is waterproof. Has a reflective logo for extra visibility in the dark. I bought a black version that fitted the colour schemes of the bikes I have, although the green version is just as nice. I got mine from a bicycle store in the UK and had it shipped to my front door for about AU$50....so it was really good value too! The leather strapping is very nice, the leather is very thick and will last for ever! The thick cotton waterproofed fabric is very robust and will also last a lifetime. The metal Carradice badge on the top of the bag is a really good finish to a great product. 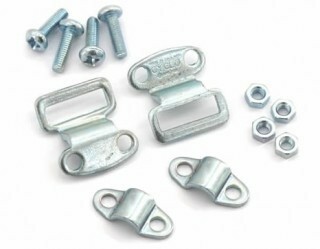 Here are some images of the Carradice Zipped Roll on my road bike. Having ridden with the bag on a couple of longer rides I've found that the bag is perfect. It's a little bit bigger, so I can carry the extra items I mentioned with ease. It's a durable bag that is easy to open, and looks great. The only drawback with the saddlebag is that the saddle must have saddlebag loops. This is OK for me because I have Brooks saddles on my bikes, and all of the Brooks saddles have the loops that are needed. But don't despair......Carradice have got this covered! The loops are lightweight, look good, and are easy to fit to any saddle. I'm very happy with the Carradice Zipped Roll....a little bit bigger, a little bit better, easy to use and very stylish! The perfect choice for your vintage bike or your modern road bike. There is more info at http://www.carradice.co.uk/ where you can see the large range of Carradice products for sale. I realize this post is quite old, but do you think that this zipped roll would hold a kryptonite evo mini, an iphone, and some keys? I'm particularly worried about the u lock. Wish Carradice did a 4 or 6L option. 9 seems a bit too big for what I ride.